The 3rdArk is a disciplined, respective and humorous group of players all having deep roots in the community, well mostly. In Events or Trainings there will always be a level of maturity but we wont bore you to tears. You're not expected to attend everything we do though please do make an effort and it's not cheap to run this. If you're considering joining/browsing regiments expect a level of quality in everything we do. We might have a website here if I bother if not just add https://steamcommunity.com/id/timewasterFTW/. The Third Arkansas was the first Arkansas regiment to enlist for the duration, the First and Second Arkansas having initially enlisted for one year and later enlisting “for the war.” Albert Rust, a prominent south Arkansas politician, was appointed colonel of the regiment. Vannoy Hartrog Manning, a lawyer from Hamburg, Arkansas, and captain of Company K, was appointed major. The Confederate War Department had initial misgivings about these volunteers from “the backwoods of Arkansas,” and decided to assign “real soldiers” to certain key positions in the regiment. Seth Maxwell Barton, a West Point graduate and native Virginian, was assigned as lieutenant-colonel. Another Virginian, Thomas Middleton Semmes, a recent Virginia Military Institute graduate, was assigned as the regimental adjutant. The Third Arkansas was then sent to a camp of instruction, where VMI cadets drilled them daily. The Third Arkansas was then ready for four long years of war, participating in six campaigns, nine battles, five major engagements, five sieges, and a long list of military operations and skirmishes. On March 4, 1862, Colonel Rust was appointed a brigadier-general in the Provisional Army of the Confederate States. Major Manning succeeded him as colonel, and commanded the Third Arkansas until he was severely wounded and captured at the Battle of Wilderness, May 6, 1864. In July, 1862, the ranks of the Third Arkansas were augmented by the addition of nearly 140 soldiers from the Second Arkansas Infantry Battalion. The Second Arkansas Battalion had been organized in October, 1861, from three companies of volunteers from El Dorado, Hot Springs and Pine Bluff. In June, 1862, the little battalion was decimated while leading an assault on the Federal position at Beaver Dam Creek, and its commander, Major William Naylor Bronaugh, mortally wounded. The War Department disbanded the battalion and transferred its survivors to the Third Arkansas. In November, 1862, the Third Arkansas was assigned to the famous Texas Brigade of the Army Northern Virginia. The Confederate War Department had determined that the troops would benefit from being brigaded with regiments from their home States. At this time, the standard brigade organization consisted of four regiments. There were three Texas regiments in the Army—the First, Fourth and Fifth—and only one Arkansas regiment. It was therefore decided to group these four western regiments together. 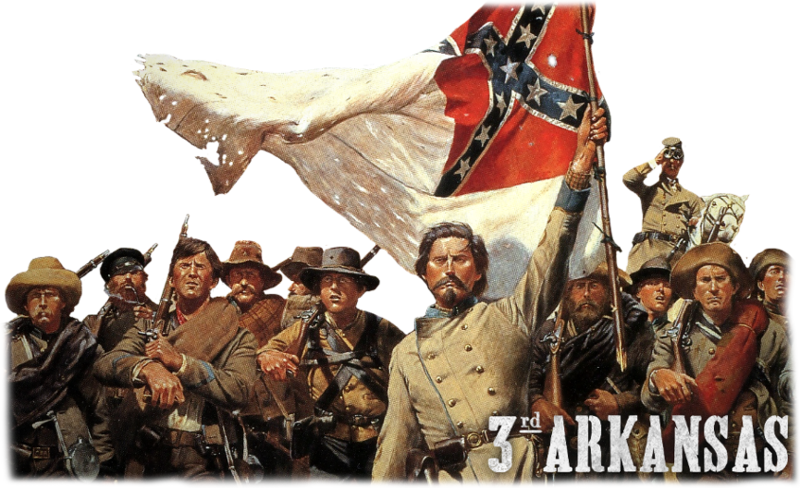 The Third Arkansas remained an integral part of Hood’s Texas Brigade until the end of the war. The Third Arkansas gained a reputation as gritty, tenacious fighters, and always seemed to end up in some of the most hotly-contested parts of the battlefield—the Sunken Road at Sharpsburg—the Devil’s Den at Gettysburg—and consequently suffered a high casualty rate. It was at the Battle of the Wilderness, May 6, 1864, that the Third Arkansas experienced some of their most serious losses, including their gallant Colonel Van Manning. Severely wounded and captured, he sat out the rest of the war as a prisoner. Major William K. Wilkins (who had succeeded Major John W. Reedy, killed in action at Chickamauga) was killed at the Wilderness. Lieutenant-Colonel Robert Samuel Taylor, was severely wounded at the Wilderness, but recovered and commanded the Third Arkansas when the Army of Northern Virginia surrendered at Appomattox Court House on April 9, 1865. The paroles of the Third Arkansas troops were finally signed on April 12, and they were released to go home. During its four years of war 1,353 men served in the Third Arkansas. Only 150 remained at the surrender.